I spent a good bit of my childhood growing up in Colorado right at the foothills of the Rockies, so I often feel the call of the mountains and the need to get a high elevation fix every once in a while. 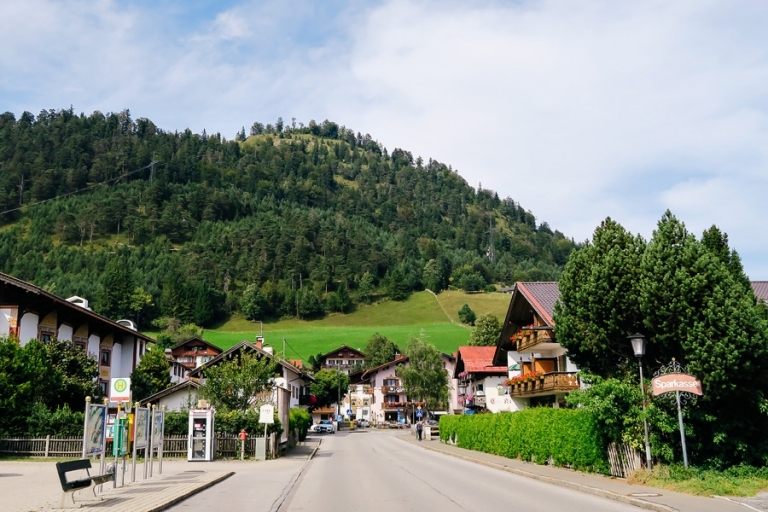 For that very reason, I incorporated a bit of Alps into our itinerary with a visit to Alpine town Mittenwald, Germany. 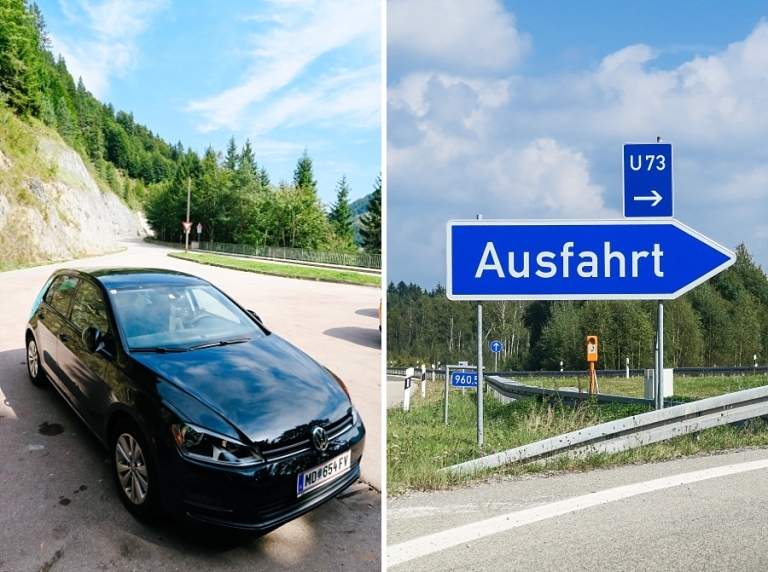 Getting to Mittenwald from Salzburg via train turned out to be a little less flexible than I wanted, so we decided to rent a car in Salzburg and hit the open road. I love train travel in Europe, but I love the adventure, freedom, and flexibility of driving even more. 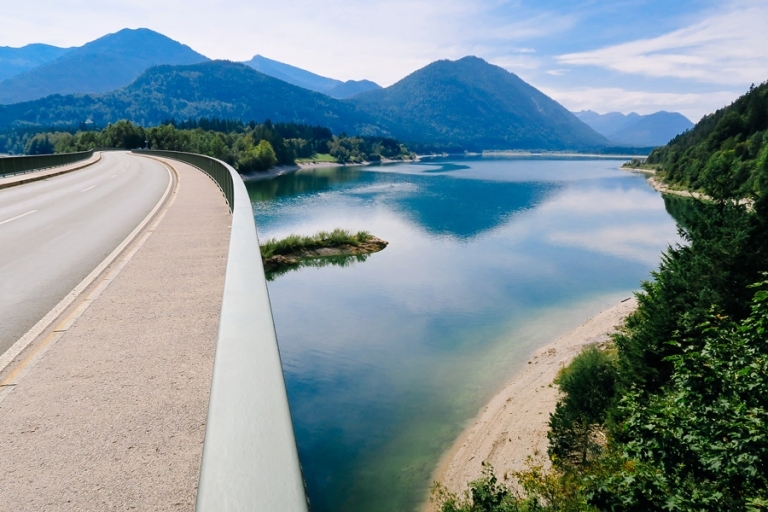 We didn’t pull over for as many photo ops as we usually do on our road trips because we were on a mission to arrive in Mittenwald early in the day, but I was happy to enjoy the scenery (not to mention the air-conditioning) from the car. As an added bonus, I had a good giggle every time I saw an exit sign in German. As we left Austria in our rear-view mirror and headed further into the German Alps (well, and the into Austrian Alps via the route we took through Innsbruck), the cutest towns and villages greeted us, and I gushed over the sweet flower boxes and painted illustrations on almost every home, biergarten, and guest house. Please forgive me for the overuse of the word charming to describe a place, but Mittenwald really could not have been any more charming. It’s exactly how I imagined small-town Bavaria, with colorful frescoes and even pretzel shaped door handles. (Those I didn’t actually imagine – they were a fun find.) We stayed at the Post Hotel, perfectly within walking distance from everything including cable car access to the Karwendel mountains. Unfortunately this was the day in our trip where we lost our clear blue skies and the weather turned considerably cooler and wet. We were grateful for the opportunity to wear long sleeves since the majority of our suitcases contained clothing for cooler weather, but we were a little disappointed to experience the Alps on a rainy day. Our concierge at the hotel kindly warned us not to bother with heading up the mountains because the view wouldn’t be worth it, but this was our only day to do so thus we stubbornly forged onward with our plans. We trekked over to the Karwendelbahn cable car and forked over a steep (no pun intended) 30 euros each to take an exhilarating ten-minute ride to the top. Note: the passes to ride the Karwendelbahn are payable by cash only, so hit the ATM before heading over to the station. And another note: an ATM is called a Geldautomat in German, which we found out through a funny conversation-by-charades with a local who didn’t speak much English. At the summit, visitors can take in the views over beers or tea and cake at the station restaurant. We knew we had limited time being fairly close to the last run of the day, so we chose to walk the trails straightaway and take time for a few photos. We didn’t end up with the postcard-perfect pictures of our view from the top due to the hazy sky, but it did stop raining and we enjoyed hiking around the trails at the top. Some of the views include both the German and Austrian Alps at the same time. And we loved peering over the edge to see tiny Mittenwald looking even tinier from 2,244 meters above sea level. Back down on the ground after our mountaintop adventure, Chris and I figured we deserved a beer or two so we headed to the main pedestrian area of the village to sit in a little biergarten for dinner and accordion music. Afterward, we strolled around the town peeking into shop windows (most places closed by 7pm) and enjoying a peaceful evening. 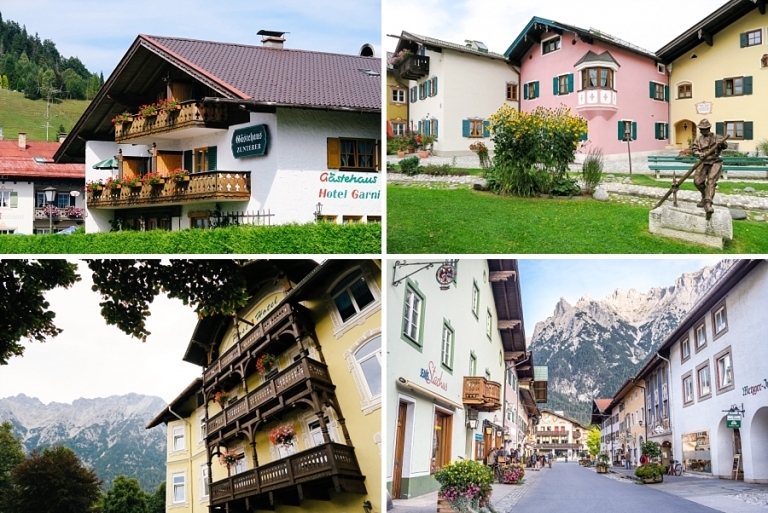 Our stay in sweet Mittenwald lasted a little under 24 hours and I would have preferred to stay there just a tad longer, but it’s definitely possible to see this town as a day-trip. We headed over to Schwangau the next morning on a mission to see the famous Neuschwanstein castle, and that post is next!